This menu help you to set some options directly from VS6 Installer. Note: in Windows 8.x this options open the File properties dialog to set manually each options. Applicable to Vista and Seven only. You can check the flag Disable desktop composition for VB6.exe. In practice, the new Aero interface will be disabled when you start VB6.exe. This is recommended because Visual Basic 6 isn't compatible with the Aero interface, therefore if you leave it enabled when you move a control on the form the action would be unbearably slow. When you close all Vb6.exe instances, the Aero interface is automatically enabled again, everything is automatic and transparent to the user. 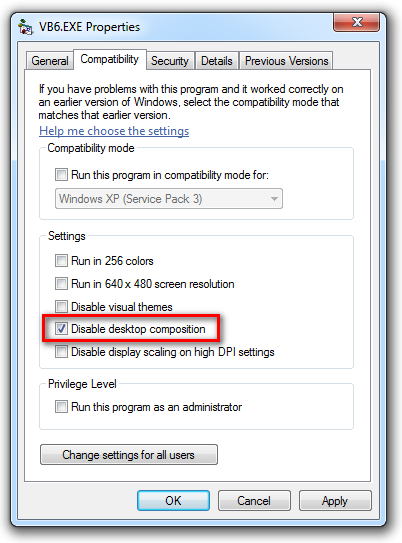 To enable the Disable desktop composition, using the corresponding command from the File menu. Not applicable to Windows 8.x. Applicable to Windows Vista, 7, and 8.x only. This option isn't really useful. Applicable to any Windows version. Set the VB6.EXE run as Administrator. This menu help you to create a VB6.EXE shortcut on Desktop and Quick Launch bar. This options allow you to delete any 'prepared' folder, to recreate them.